Avoiding the pitfalls of underground drains - Alpine Services, Inc. 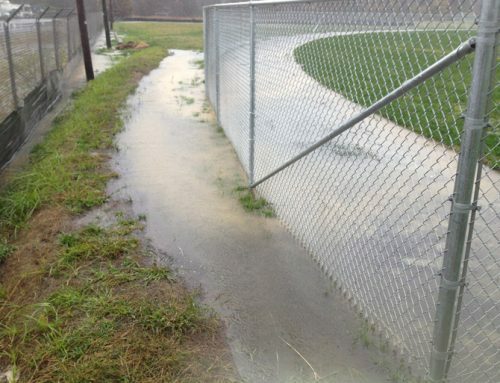 Underground drains are commonly used on natural and artificial turf athletic fields. Unfortunately, significant issues related to drainage systems’ performance are often overlooked in project specifications and during construction. Here are a few pitfalls you should avoid. Although the depth of an underground drainage ditch is usually specified in a contract, the grade tolerance for the ditch’s bottom often is not. If not properly graded, the final result can be too high or low when compared to the absolute grade. When the grade isn’t proper, the drain pipes that are laid in the ditch often must be oversized to make the ditch work properly. When a larger pipe is used because the ditch bottom grade tolerance is unspecified and therefore uneven, water will lay in low spots in the pipe. Although the pipe will still work because of the larger diameter, the owner’s costs of construction may be higher than need be (larger pipe costs more, it costs more to haul away excess soil displaced by the pipe, and more trench fill stone must be purchased). It is much less expensive to precisely grade the bottom of underground drain trenches so that you can use smaller diameter pipes. The material used to backfill underground drain trenches is very important. It is common for drawings to call for “French” drains with trenches backfilled with topsoil. Drains built this way do not work. Topsoil and most other types of soil compact with play and form a waterproof cover over and around drain pipes. The media that the trench is installed into must be considered also; most soils have a very low horizontal hydraulic conductivity (about 1” per hour or less), meaning that water simply cannot seep into the pipe from the side of the trench. Underground drain performance is only slightly better when pipes are bedded in sand or #8 stone. Water still must get into the sand or stone from the sides of the ditch before it can get into the pipe. The solution to these problems is to extend the sand or stone that surrounds the pipes to the surface of the field so that water can enter the ditch (and pipe) directly from the surface. As with most things, maintenance is required to keep underground drains working properly. Sand or stone (usually sand) that extends to a field’s surface will become clogged with soil and other contaminants over time – remember, it is a filter! Clogging often happens 5-8 years after installation. The beauty of using sand is that we can easily change the filter. 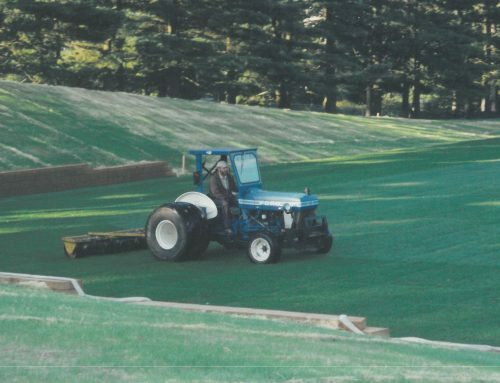 Typically we use a sod cutter to remove the top 2” of grass and sand directly above the drain trench (and its pipe) and then put down new sand and grass (seed, or sod that is clean). It is also a good idea to flush drain pipes periodically to prevent them from clogging. We install 45-degree fittings at the end of each pipe, mark them with big nails so that they can be found with a metal detector to make flushing easier. 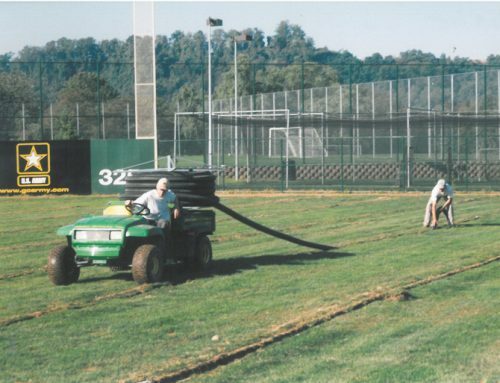 If you are planning to build an athletic field with underground drains, please heed this advice and be more deliberate with your project’s specifications. These ideas will help your drains work well and will lower the costs of construction and maintenance. 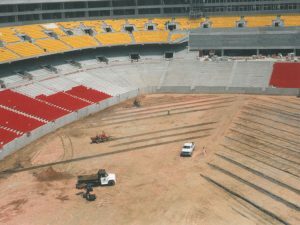 Everyone wants to build a good field the first time. I like the idea to flush out your drains regularly to prevent any potential clogging. I definitely think that we should have some grates installed over the trenches in order to prevent debris as well. I can definitely see why you would want to avoid any form of backup in your drainage system because it could lead to water damage.